With the first six episodes of Gortimer Gibbon’s Life on Normal Street streaming on Amazon Prime, I recently sat down with my family to see the finished episodes in their fully-formed glory. Watching them together, I was reminded why I’ve been so excited to be a part of this show. From the imaginative and unpredictable story lines from creator David Anaxagoras and his fellow writers to the brilliantly-acted performances from Ashley Boettcher, Drew Justice, and Sloane Morgan Siegel, the show’s got a whole lot to love. I flew out to LA a few times during the production and was blown away by everything that goes into a production like this- so many people I met that are an integral part of the process, equally important in making the world of Normal Street come to life. A big “wow” moment for me was walking through the soundstage that is Mel’s observatory, created by the insanely talented Production Designer Kristan Andrews. Seriously, there are so many amazing pieces that fit into the final mosaic that I could list paragraphs full of them here! And next to these hundreds of people that make up the Normal Street family, there’s a space for myself and two other animators Jared Hedges and Em Cooper. Paired with the perfectly scored music of composer Sasha Gordon, we helped create the legends and mythology of Normal Street, the hint of magic that stews beneath the normal. I’m not sure if I can think of many live action shows that have such a unique place for ‘guest’ animators as executive producer Luke Matheny has created in the framework of Gortimer Gibbon’s Life on Normal Street. Within each episode, some sort of backstory- whether it be a myth, legend, or some other form of exposition- unfolds in a unique animated style, dubbed by the creative team as an ‘Animated Storybomb’. It reminds me of the way ‘variety show’ kids programming in the 1980s like Sesame Street, Pinwheel, and PeeWee’s Playhouse would employ multiple animation techniques (like puppetry, stop-motion, and rotoscoping) all into the creative tapestry of their show. In Gortimer and the Mystical Mind Eraser, scenes from Fred’s life (played by Luke Matheny) whiz above his head in a colored pencil/magic marker style, as Fred tries to remember all the life moments he’s chosen to erase from his consciousness. In the next episode, Gortimer Gets Shushed, the mysterious hooded driver of the Normal Street Bookmobile recounts how she became trapped in an endless state of limbo, which I re-enacted in a paper-craft stop-motion style of animation. Following that episode comes Ranger and the Legend of Pendragon’s Gavel, where Alethea Jones directed me to bring the myth of the enchanting gavel (with powers reminiscent of the Sword and the Stone) to life with a medieval standed-glass style of animation. Within the same episode, Jared Hedges animates the ‘real truth’ behind the legend of the gavel, in a style of animation that’s comical, punchy, and recalls the great work of the Monty Python show and films. And to give you an idea of what’s to come, animation styles in future episodes include an eerie ‘shadow-box’ animation technique from Jared Hedges, a gorgeous rotoscoped oil-painting technique from Em Cooper, and even a watercolor/anime-inspired style by my wife Lisa Ray and myself. So even though the last four months of my life have been kind of a blur, with inboxes full of Gortimer scripts, rough edits of episodes, voice-over audio tracks, and plenty of tough deadlines (at least for a one-man animation team), I’m keeping my fingers crossed that Gortimer Gibbon’s Life on Normal Street gets a fair chance with the general public. I can see Gortimer, Mel, and Ranger getting into an endless number of scenarios. They’re a great combination of personalty types that push and pull each other forward through active stories that aren’t predictable, cynical, or pandering. And as the live-action propels forward, I hope those animated backstories keep playing a role in explaining the myth and folklore of Normal Street. And I hope it’s done in every animation technique imaginable. 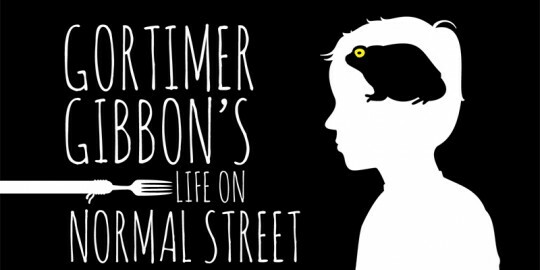 Post by Gortimer Gibbon’s Life on Normal Street.